(Compiled from news reports at London’s Daily Telegraph, The Wall Street Journal and Reuters) – British Prime Minister Theresa May and U.S. President Donald Trump have agreed that “a window of opportunity” now exists to persuade Russia to break ties with Syrian President Bashar al-Assad. The Prime Minister and the president agreed that a window of opportunity now exists in which to persuade Russia that its alliance with Assad is no longer in its strategic interest. President Trump also spoke to German Chancellor Angela Merkel and agreed with both European allies “on the importance of holding Syrian President Bashar al-Assad accountable,” the White House said in a statement. Trump administration officials said a week ago that they had abandoned the goal of forcing Assad to leave power. However, Assad’s chemical weapons attack on Idlib province last Tuesday, which left at least 87 people dead including more than 30 children, had a “profound effect” on the US president and led him to order retaliatory air strikes against an Assad regime air base. Secretary Tillerson arrived in Moscow Tuesday following a meeting in Italy of the G7 (Group of 7 industrialized nations: US, UK, France, Germany, Italy, Canada and Japan). After the meeting, calling the strike a “game changer,” British Foreign Secretary Boris Johnson said support for the Syrian president “was toxifying the reputation of Russia” and suggested sanctions could be imposed on Moscow if it refused to change course. “What we’re trying to do is to give Rex Tillerson the clearest possible mandate from us as the West, the UK, all our allies here, to say to the Russians ‘this is your choice: stick with that guy, stick with that tyrant, or work with us to find a better solution’,” Johnson said after meeting Tillerson. Before leaving Italy, Tillerson issued a new U.S. demand for the eventual removal of Mr. Assad, who is blamed by the U.S. and West for the long-running civil war in Syria. Tillerson said Russia had failed in its role as sponsor of a 2013 deal made by the Obama administration under which Assad promised to give up his chemical arsenal. U.S. officials said the air strike and renewed pressure from the international community could help Mr. Tillerson make his case to Russia. 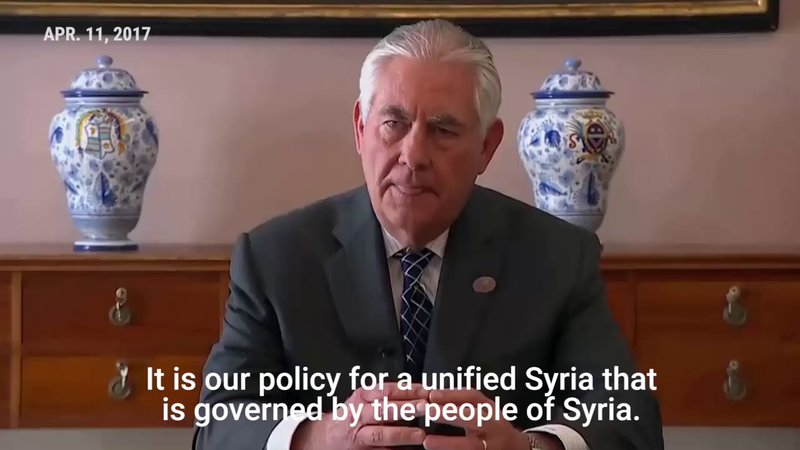 Reuters reported: U.S. Secretary of State Rex Tillerson carried a unified message from world powers to Moscow, denouncing Russian support for Syria and taking up America’s traditional role as leader of the West on behalf of Donald Trump’s administration. Ahead of Mr. Tillerson’s arrival, the Russian Foreign Ministry in a statement blamed the U.S. for pursuing a policy of “American exceptionalism,” that tried to punish Russia economically and limit its influence in international affairs. Although the State Department began planning Mr. Tillerson’s trip before the deadly chemical weapons attack last week in Syria, that event and the U.S. response have fueled tensions between Moscow and Washington and have raised the stakes of the visit. 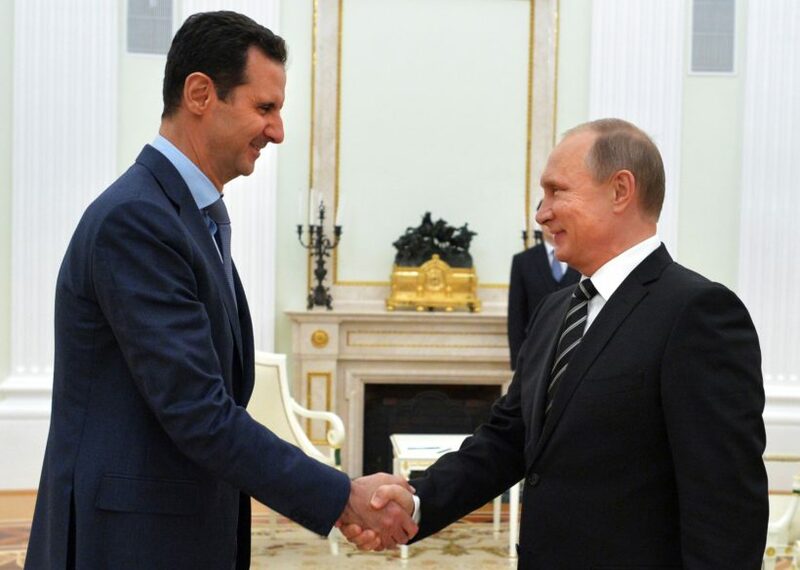 “The most important factor for Putin is not loyalty to Assad, but stability of the Syrian regime, which enables Russia to hold a significant geopolitical position in the Middle East. He could conceivably achieve that in a post-Assad scenario. So there is room for negotiation on that point,” said Matthew Rojansky, a Russia expert at the Wilson Center in Washington. Secretary Tillerson’s visit beginning Tuesday is his first official trip to Moscow, but had met with Putin when CEO of Exxon Mobil, which has gigantic projects in Russia. He was awarded Russia’s “Order of Friendship” by Putin in 2013. Tillerson is set to meet Russia’s foreign minister Sergei Lavrov. A Kremlin spokesman said Monday that a meeting between Mr. Tillerson and Mr. Putin wasn’t on the Russian leader’s calendar, despite earlier U.S. expectations of such a session. Current and former officials who have planned such trips said it isn’t unusual for a meeting with Mr. Putin to remain uncertain until the last minute, but that usually the Russian leader grants an audience to the U.S. Secretary of State. “The Prime Minister and president also stressed the importance of the international community, including China, putting pressure on North Korea to constrain the threat it poses,” the statement said. Compiled from news reports at London’s Daily Telegraph, The Wall Street Journal and Reuters for educational purposes only. May not be reproduced on other websites without permission. 2. What opportunity do Teresa May and Donald Trump agree the West has regarding Syria? 3. What did Boris Johnson say about Rex Tillerson’s talks with Russia in Moscow following the G7 meeting in Italy? 4. Before leaving Italy for Russia, what did Secretary Tillerson say about the Assad regime? 5. Trump administration officials said a week ago that they had abandoned the goal of forcing Assad to leave power. Why have they changed course since then? 6. Watch the news conference clip under “Resources” below. What is your reaction to Secretary Tillerson’s resolve? (optimistic or pessimistic) Explain your answer. Ask a parent: The members of the G7 are united in their support for the U.S. in this role. What do you think of the Trump administration “taking up America’s traditional role as leader of the West”? Please explain your answer. Read the editorial under “Background” below the questions. Do you agree with the editors’ assertions about President Trump? Explain your answer. President Trump is emerging from his first overseas crisis looking calm and competent, with his foreign-policy and national-security teams hitting on all cylinders. Surprise! His airstrike against Bashar al-Assad’s forces in Syria won the support of 78 US senators, including 30 Democrats — albeit with some qualifications. The fact that Trump executed what came off as a rapid turnaround on his Syria policy in the wake of a war crime indicates he’s not locked into preconceived notions or policies: He’s adjusting to reality as it develops. Yes, Trump lacks the kind of grand foreign-policy doctrine pushed by the last two presidents — but that’s not such a bad thing. In a world full of unknown and unpredictable factors, he’s prepared to act on the basis of actual realities, unbeholden to an agenda of aggressive nation-building or appeasement. Which is why the White House is taking pains to stress that the Syria strike is not a preliminary to an anti-Assad military campaign, or a policy of active regime change. Yet, at the same time, Secretary of State Rex Tillerson and National Security Adviser H.R. McMaster are also making it clear that the United States “cannot stand idly by” if Assad continues to use chemical weapons. That’s a tough but cautious line, awaiting developments and keeping all US options open. It’s also putting the lie to fears that the president would be a puppet of Russian President Vladimir Putin. Indeed, the opposite has proved true: Relations between Moscow and Washington are seriously strained, especially now that the administration says it’s convinced Putin knew in advance about Assad’s gas attack. And the criticism from Tillerson, now in Russia (where Putin is refusing to meet with him), and UN Ambassador Nikki Haley has been tough and unremitting. Trump’s critics predicted that as president he’d either ignore crises or flail about helplessly. What we’ve seen thus far is a president who, though still learning the ropes, is letting himself be guided by reality, not naïve or wishful thinking.